Anthony Weiner admitted in an interview Wednesday that there might be other embarrassing photos of him out there that have yet to surface. In the one-on-one with RNN-TV, Weiner didn’t deny that there was a possibility there could be other photos like the one that led the former congressman — who is now attempting a comeback — to be disgraced, and ultimately forced to resign in 2011. “If reporters want to go try to find more, I can’t say that they’re not going to be able to find another picture, or find another … person who may want to come out on their own, but I’m not going to contribute to that. 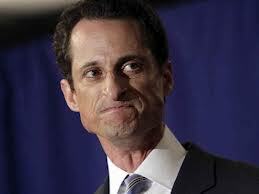 The basics of the story are not gonna change,” Weiner told RNN-TV’s Dominic Carter. And who cares about this?? ?